Limousin consisted of three departments. Creuse is the smallest and least populated, in fact it used to boast the thinnest Pages Jaune (yellow pages) in the whole of France! I love the wildness of Creuse but chose to make my home in Haute-Vienne which is the department next to Vienne and Charente and the one which contains the city of Limoges. This department is full of lakes and rivers and gently undulating countryside. The third department is Correze which is next to Dordogne and has a more dramatic landscape than Haute-Vienne. It is probably the most sophisticated of the three old Limousin departments. But, wherever you choose your home in this area you won’t fail to love the people, the countryside and the gentle way of life. Limousin has now changed its name to Nouvelle-Aquitaine, which has been created by the merger of Limousin, Poitou-Charentes and Aquitaine. 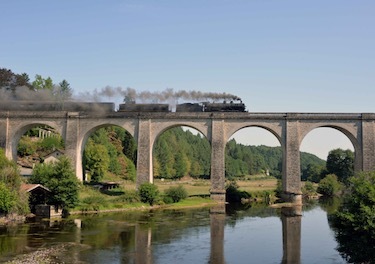 The summer months in Nouvelle-Aquitaine are when the steam train comes out of hibernation and offers a joyful rail journey from Limoges to Eymoutiers. The final run of the summer is usually the last weekend in August and this one is always my favourite of the year as not only can passengers enjoy the viaducts, tunnels and panoramic views that the steam train offers but on this special trip a traditional folk music group are on board to entertain you as you steam your way through the Haute-Vienne countryside. Having arrived at Eymoutiers you can disembark and enjoy the mountain atmosphere of this little town situated on the banks of the River Vienne. There are medieval houses, a huge church, a few restaurants and cafés, local shops and pretty river banks to wander along. It is also well worth finding the time to visit Espace Paul Rebeyrolle, a new art gallery dedicated to the work of this artist who was born in Eymoutiers. When I lived close to Limoges an annual trip on the steam train was an essential part of summer for all of the family from elderly parents to young grandchildren. Buying a property in Haute-Vienne, Nouvelle-Aquitaine, will allow you to enjoy this annual treat too.